Herbs are easy to grow indoors – and it’s a great way to have fresh herbs in your kitchen all winter long! Here are a few fun and creative tips for starting your own indoor herb garden. Having fresh herbs on hand when you need them will not only save you money and encourage you to cook at home more often, but it can also be a lot of fun to grow them! 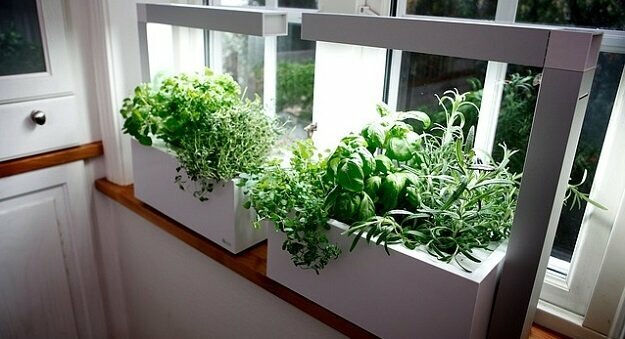 This is also a great option for those who live in an apartment or condo without much outdoor gardening space. And, if you have kids, they will love helping you out with some of these creative DIY ideas for starting an indoor herb garden. One idea for growing herbs indoors is to use just one large pot instead of multiple little pots. This provides a unique growing opportunity, while also taking up less space in your kitchen. You might have a small kitchen window where there is really only space for a single large pot. Use this to your advantage by planting just one of several different herbs in the pot, spacing them out as much as you can. Most herb plants have fairly small growing habits and each requires the same type of soil and watering schedule, so the majority of herbs can be grown together like this in the same container. Another option for a DIY indoor herb garden project is to hang the pots of herbs in front of the window, instead of trying to set them on the counter or windowsill. This is a good option when you have good light coming through the window, but not really enough space to put the pots. You might have a kitchen window with just a slim windowsill, but not a roomy ledge. In this case, you can instead hang the pots of growing herbs from the ceiling in your kitchen to where they reach down to the window and get direct sunlight. This will also give a unique look to your kitchen! Terrariums are a lot of fun for kids as they can include various greenery and often have small objects, such as plastic dinosaurs or fairies. This is a great family-friendly way to create your indoor herb garden. When choosing the plants for the terrarium, include herbs such as rosemary, oregano, basil, and mint for added scent, beautiful color, and great flavor to add to your meals. If you do want to use individual containers, why not use mason jars? They are inexpensive, last a long time, and since you can see through them, you are able to track the growth. Plus they have a nice homey look. You can choose any size jar you like, but for ease of planting and picking, make sure to use wide-mouth jars. Place each herb plant into each mason jar half-way filled with potting soil, then set it in front of a window inside your home that gets the best light. Be sure not to water too often, since your jar won’t have drainage holes! Note: Starting this week, we will temporarily be moving to a twice-a-week posting schedule until gardening season picks back up in the spring. But be sure to stay tuned Tuesdays and Thursdays for more sustainable gardening tips and ideas, including plenty of ways to grow fresh food all winter long!